Goodbye 2011 – Hello 2012! 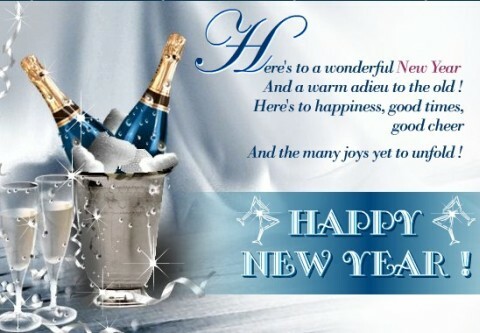 Wishing you all a very happy, healthy, safe, and prosperous 2012! Am I writing a sequel? I have been asked many times if my second book, Dreams and Expectations, will be a continuation of Promises. The short answer is, no, it is not a sequel. You’re about to get the long answer. Have you ever become so involved with a television show, movie, or book that you wondered how the story would have worked out if a certain event had happened later in the story, or sooner, or hadn’t happened at all? How would Star Trek’s Mr. Spock have changed if his Vulcan father had died when he was very young and his mother had returned to Earth, bringing Spock with her? What would Monica from Friends have been like if she hadn’t been teased as a child about being overweight, making her obsessive about her food intake, and eventually everything else? What would have happened to Bruce Wayne of Batman if his parents hadn’t brought him along the night they had been killed? Some fan fiction authors take it even further, trying to answer more complicated questions such as what occurred in Detective Monk’s life to cause him to have so many fears, or what happened to Edward Cullen of Twilight during the time that he was away from Bella? What I do is take Jane Austen’s characters from Pride and Prejudice and place them in a different situation than they were in the original novel. In each of my fan fiction novels, they will also be placed into a different situation than in my other novels. My stories usually involve the more complicated “what if” questions. In Promises, Elizabeth Bennet and Fitzwilliam Darcy’s fathers have been friends since childhood, the main characters meet as children and fall in love very early in the story, but some things happen to separate them. Obstacles are thrown in their way by others and by their own stubborn pride. We’ll find out if their love can survive through it all during the time frame of the original novel. In Dreams and Expectations, we find the same couple. They meet at the same time as in Jane Austen’s novel—at the Meryton assembly ball—but Darcy has already fallen “in love at first sight” with Elizabeth when he saw her two weeks before the ball, and had been dreaming about her ever since. Before long, familial expectations, a mystery, a villainous plot, and a kidnapping will get in the way of this favorite couple’s happy ever after. The story that I am writing at the moment, All Hallow’s Eve, has Elizabeth as the leader of a secret, magical cult-society that exists at the same time as the original novel. She is responsible for performing a ritual that allows the good souls who have passed on into the Otherworld to visit Earth on All Hallow’s Eve. Evil is about to attack, and those from the Otherworld have assigned Darcy to protect her. I am also working on some stories that place these characters in modern times. One story has Elizabeth’s cell phone receiving photos that predict the future as a result of an ancient gypsy blessing that an ancestor received in 1809, when she saved the life of a gypsy king’s wife. “Couldn’t you change the names of the characters and locations?” you might ask, as others have before you. Yes, I certainly could, and maybe someday I will move on to original characters, but I love Pride and Prejudice and Darcy and Lizzy too much to do that right now. If it bothers you, you have my permission to pretend that it is just a quirk of mine, or merely a coincidence, that all of my main characters have the same names in each story! I should mention that I’m still not sure when Dreams and Expectations will be released. My husband Matthew Sotis is busy painting the cover art and my editors, Gayle Mills (author of the short story The Tryst) and Robin Helm (author of the Guardian Trilogy), are about half-way through editing the text. I hope that you all enjoyed your holidays and have a safe and happy new year! I’m a clue in a crossword puzzle! 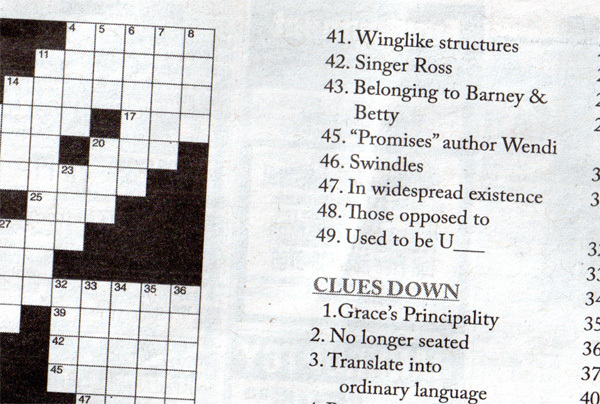 New York Newsday’s Hometown Shopper, December 21 edition, page 19, has a crossword. I’m the question for 45 down! I’m so excited! What a very nice Christmas present. 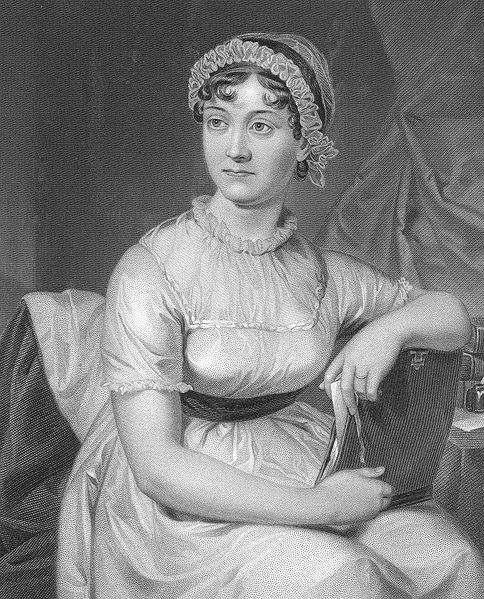 Happy 236th Birthday to Jane Austen! All Hallow’s Eve, Chapter 10 is posted on FanFiction.Net and DarcyandLizzy.com. Sorry, everyone! Chapter 10 of ALL HALLOW’S EVE is going to be late. I’m not sure how late. All Hallow’s Eve, Chapter 9, has been posted to DarcyandLizzy.com and FanFiction.Net. Hope you like it!